Treadmills are popular in home gyms, but choosing the right one can be difficult because there are so many available. 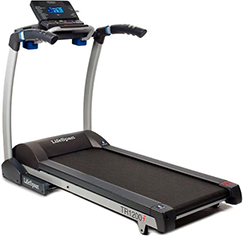 Our top pick for anyone who is looking for a durable, interactive, and high-end treadmill is the LifeSpan TR 1200i Folding Treadmill. This product has everything that any avid runner would need, whether you’re working out at home to lose weight or train for an intense marathon. How Does the LifeSpan TR 1200i Work? The LifeSpan TR 1200i has a lot to offer, and that’s why we love it. The handlebar controls allow you to make changes to your incline and speed without even needing to lift your hands up off the bars. It also provides users with a 20″ x 56″ running surface that supports individuals weighing up to 300 pounds, so you will feel confident that you won’t end up slipping or falling off of the machine. The easy-to-read digital display tracks your time, calories, distance, steps, heart rate, speed, and incline level. And every time you exercise on this treadmill, it will save your data so that you can track your progress. 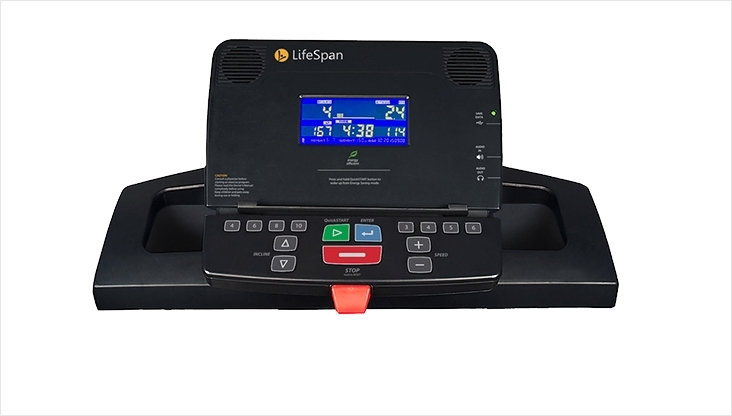 With the purchase of this equipment, you’ll also get an account at the LifeSpan Fitness Club online so that you can upload your data, gain access to more workout routines, and track your progress even more closely. Just be sure to set up your machine so that you can personalize it with your age, gender, and weight. Using its own Intelli-Guard technology, the machine will automatically turn off after it senses that you haven’t been walking or running on it for 20 seconds, thereby preventing injuries. And its Intelli-Step technology is also able to effectively count every step you take so that you can monitor your progress and increase your endurance over time to improve your health. Two heart rate monitors help you either keep a consistent heart rate throughout your workout or switch between high-intensity and low-intensity workouts for effective interval training. Two customizable programs are also available. What are the Health Benefits of Using the This Product? Walking, jogging, or running at home on a treadmill is a secure way to get a workout that will improve your entire cardiovascular system as well as help build muscles, especially those in your lower body. With a treadmill like the LifeSpan TR 1200i, you can rest assured that your joints will be supported and you won’t need to worry about injuries that can result from uneven terrain or wet conditions outside. The monitors on the machine will keep track of your heart rate so that you don’t overexert yourself, and you can keep yourself motivated for every workout by choosing from the many preset workouts or customizing your own. This will help you stay consistent and will assist you in achieving your fitness goals. Two heart rate monitors help you either keep a consistent heart rate throughout your workout or switch between high-intensity and low-intensity workouts for effective interval training. Users who have given the LifeSpan TR 1200i a try love it. There are more than 100 reviews on Amazon, and the product has an overall 4.3-star rating. Buyers love the myriad features, and one reviewer even stated it’s “hard to find a better treadmill.” Other reviewers claim that the product is “awesome” and lives up to all of its claims. Large, soft, silicone buttons make it easy to set up the machine to get going and to program it or make changes during your workout so you don’t fumble to hit the right buttons. 17 preset workout programs for losing weight, improving general health, and sports training. Built-in speakers and iPod/headphone jack. Lifetime warranty on the motor and frame. 3-year warranty on parts. 1-year warranty on labor. You can certainly find the LifeSpan TR 1200i in a variety of retail locations and sporting goods stores, as well as on online stores. However, we always recommend sticking with Amazon.com. The site is reliable, it provides excellent customer service, and you can get free shipping on this item that will have the product delivered right to your door before you know it. The item costs $999 on Amazon, which is a substantial savings off the list price as well. You already know that we love the LifeSpan TR 1200i, but if you’re still on the hunt for more reviews on the product before making your purchase, definitely head over to Amazon, where you can find more than 100 customer reviews that will help you make a decision. We really recommend giving the LifeSpan TR 1200i Folding Treadmill a try if you are looking for a machine that you can enjoy for many years to come. This high-end model features everything that you need to have a safe, effective workout.